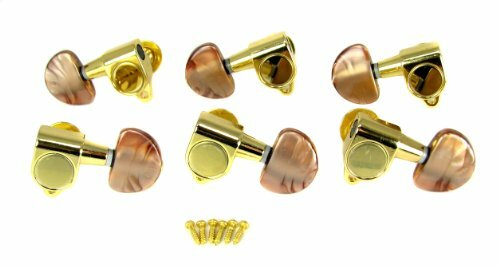 This is a 6pc set of Gold-plated sealed-gear guitar tuners with classic "half moon" (or Lima bean) style tuner buttons in a nice mocha (soft brown) color. These tuners are set up for "3 Left/3 Right" configuration on the headstock. These tuners feature screw-in style bushings instead of the press fit variety, with a single screw used to mount them from the back. The bushing screws directly into the main tuner housing, through the headstock, for a snug, secure fit. The washer goes on the front of the headstock between the bushing nut and the wood, for a stylish, distinctive look. This is the style of tuner often seen on electric guitars such as Fender Telecaster(tm) and Stratocaster(tm). These great tuners can be used on cigar box guitars, regular guitars, diddley bows, banjos -- pretty much any stringed instrument that can be set up with a standard machine head! They are intended for headstocks that are between 0.46" (11.72mm) and 0.65" (16.5mm) thick. A good rule of thumb is 1/2" to 5/8" thick, with 9/16" being the ideal. Trying to use these with thicker or thinner headstocks may not work. These tuners include 6 metal gold-plated screw-in bushings, screws and washers.